Thyroid and parathyroid surgeons have been told that monitoring vocal cord laryngeal nerves during surgery may decrease the incidence of vocal cord nerve injury, but the data shows vocal cord nerve monitoring dramatically increases nerve damage. Surgeons don’t like hurting their patients. We will do anything, it seems, to prevent injuring our patients while they lie on an operating table allowing us to cut them open. The biggest fear for surgeons performing parathyroid surgery and thyroid surgery is injury to the vocal cord nerve (the recurrent laryngeal nerve). If this nerve is injured, it can result in a temporary or permanent loss of voice for the patient. In some cases, they will talk in a whisper forever. This can be a devastating injury because patients with a recurrent laryngeal nerve injury have a hard time communicating on the phone, at work, and at home. Not being able to talk because of a vocal cord nerve injury can ruin your life. https://www.parathyroid.com/blog/wp-content/uploads/2013/10/nerve-monitoring-et-tube-e1382740718930-300x223.jpg nerve monitoring endotracheal tube.A typical nerve-monitoring endotracheal tube. The tube is placed into the patient's trachea during anesthesia. Wires along the side of the tube can sense movement of the vocal cords when the surgeon stimulates the recurrent laryngeal nerve with an electric probe. Several companies make an endotracheal tube that has wires on both sides of it that can sense movement of the vocal cords. These companies sell these nerve-monitoring endotracheal tubes with the notion that surgeons can “stimulate” the vocal cord nerve in the operating room with a weak electrical pulse which causes the vocal cords to move against the wires on the tube which sense the movement and cause a beep or the movement of a dial on a recording device. In theory, a surgeon will be less likely to injure the recurrent laryngeal nerve if he knows where it is and can tell when he is about to cut or harm it. With full disclosure, we have never used a nerve monitoring endotracheal tube — in fact, we don’t even intubate our patients (we don’t put a tube down their trachea to put them asleep for parathyroid surgery). Of course, we do about 50 parathyroid operations per week (about 10 per day, which is more than 15 times the volume of any other hospital in the world). Thus, we don’t need this “fancy device” because we know the recurrent laryngeal nerves very well. If it weren’t for these nerves, it is doubtful we would have a business. Of course, all surgeons are not experts in thyroid/parathyroid surgery, and the vast majority of surgeons who perform thyroid and parathyroid surgery are fine surgeons. But it has been known for decades that the incidence of vocal cord nerve damage is directly related to the experience of the surgeon. Inexperienced surgeons are more likely to use a nerve-monitoring endotracheal tube. We have never used one, and can’t imagine the need for one. We have had one permanent nerve injury in our last 23,000+ operations, and that was in a man who had two previous thyroid/parathyroid operaions. Nerve Monitoring Endotracheal Tubes Dramatically Increase Vocal Cord Nerve Damage. I presented a large prospective study (1000 consecutive patients) at the 2013 annual meeting of the American College of Surgeons (10/17/13) entitled: Nerve Monitoring (NIMS) Increases Recurrent Laryngeal Nerve Injury During Failed Parathyroidectomy. Here is the abstract. Background: Monitoring recurrent laryngeal nerve (RLN) function during thyroid/parathyroid surgery has been suggested to decrease incidence of RLN injury. Methods: 1000 consecutive cases of failed parathyroidectomy referred to tertiary treatment center over 5 years assessed NIMS (Nerve Monitoring) use and 11 other objective measures for effect on RLN injury. Results: All patients were intubated (study requirement), with 321 (32%) using NIMS. Patient age, calcium, PTH, gender, tumor size and weight were identical between groups. RLN injury (>30 days duration) occurred in 39 (12.1%) NIMS patients and 24 (3.5%) No-NIMS (p<0.0001). RLN injury (>6 months) occurred in 23 (7.2%) NIMS patients and 14 (2%) No-NIMS (p<0.0001). All injuries > 6 months had cords assessed by scope. 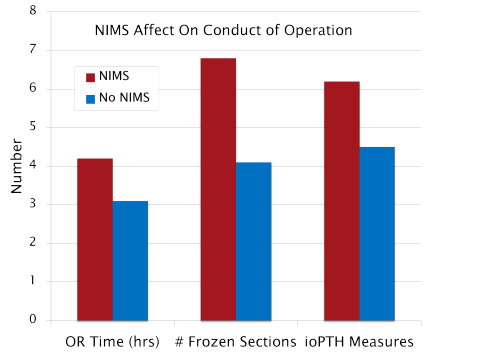 Operative times were longer with NIMS use (4.2 +0.8 vs. 3.1 +1.1 hrs, p<0.0001), and had more frozen sections (6.8 +2 vs. 4.1 +1.5, p<0.0001). Surgical training (ENT vs. General Surgeon) had no effect on RLN injury (p=0.11) although ENT used NIMS more often (78% vs. 26%, p<0.001). University vs. private had no effect on RLN injury (p=0.65). RLN injury rates decreased with surgeon experience (cases per year) in No-NIMS operations (p<0.001), but increased in NIMS operations (p<0.001) with highest RLN injury seen with surgeons performing 20-50 parathyroidectomy/year using NIMS (p<0.001). 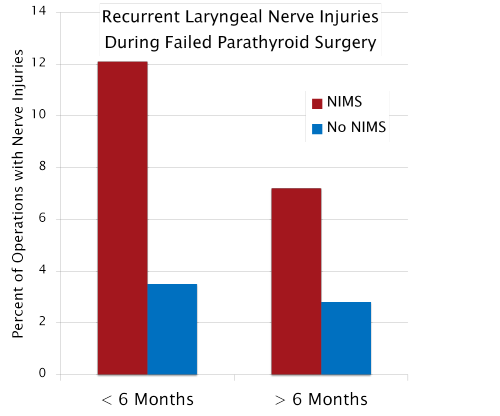 Conclusion: During unsuccessful parathyroidectomy, NIMS use may provide surgeons a false sense of security allowing more extensive dissecting yielding significantly increased rates of RLN injury which were more frequently permanent. No other operative component has such a negative impact on outcome even negating the protective effect of surgeon experience when NIMS is not used. Surgeons believe nerve monitoring will decrease their chances of getting sued for malpractice. There have never been any studies published that we are aware of that shows the incidence of vocal cord nerve damage is decreased when a nerve monitoring endotracheal tube has been used. However, the surgeons that promote the use of these tubes, AND the companies that make the tubes, state that the use of this tube decreases the chances of a surgeon getting sued for malpractice. There is no good evidence of this either, but this is talked about all the time in surgery circles. Surgeons actually believe that using the tube will prevent a malpractice case if they hurt the patient and cut a vocal cord nerve by mistake. The vast majority of surgeons I talk to aren’t sure that the nerve monitoring (NIMS) tube actually decreases nerve injury, but every single surgeon says they use it so they won’t get sued. Thus they all admit that they are using this tube for themselves, not for the patient! But now we have a scientific study that shows using the vocal cord monitoring endotracheal tube actually INCREASES the incidence of nerve injury. The graph on the left shows the rate of vocal cord injury during failed parathyroid surgery when a nerve monitoring tube is used (red bars) and when the patient is intubated with a regular endotracheal tube and no nerve monitoring is used. There is no other difference in these two groups (1000 patients). The only difference is one tube has wires in it and the surgeon that thinks these wires in the tube will save him/her from doing damage to the vocal cord nerve. Importantly, the rate of permanent nerve injury is almost three time higher also. How can this happen? How can a device that (when working properly) can alert the surgeon that he/she is dangerously close to the very fragile recurrent laryngeal nerve actually result in an INCREASE in the rate of nerve injury? Well the results of our study in 1000 patients (all operated on at some other facility and then sent to our center for a second (or third, or fourth) parathyroid operation) shows that surgeons believe that the nerve monitoring tube will save them from making a mistake and therefore these surgeons operate longer and more aggressively, removing more tissue, trying harder to find and remove the parathyroid tumor. The graph on the left shows that during failed parathyroid surgery the presence of a nerve monitoring endotracheal tube causes surgeons to operate longer, more aggressively, removing more tissues for biopsy, and making more measurements of parathyroid hormone. Let’s look at our conclusions in more detail (all of the following were very statistically significant, p<0.0001). • Surgeons using nerve monitoring tubes operate longer and more aggressively when adenoma cannot be found. • Surgeons with little experience have fewer nerve injuries than more experienced surgeons employing nerve monitoring endotracheal tubes (during failed surgery). • The rate of recurrent laryngeal nerve injury during failed parathyroid surgery is three fold higher when nerve monitoring is used. • No other variable (ENT surgeon vs. general surgeon, university vs. private practice) had an effect on the rate of recurrent laryngeal nerve injury. • Recurrent laryngeal nerve injuries during failed parathyroid surgery are more commonly permanent when nerve monitoring is used. • Otolaryngologists (ENT) performed 41% of failed parathyroid operations and were 3 times more likely to use Nerve monitoring endotracheal tubes. • University-based surgeons comprised 15% of failed operations, but were twice as likely to use nerve monitoring than private practice (p<0.001). • University general surgeons were twice as likely to use nerve monitoring (p<0.001) vs. general surgeons in private practice. • Although ENT surgeons used nerve monitoring more often than general surgeons, the rate of nerve injury was similar. • Although annual surgeon volume had a significant effect on the incidence of nerve injury, it was still less of a factor than the use of nerve monitoring endotracheal tubes. • Recurrent nerve monitoring use is associated with significant increases in recurrent laryngeal nerve injury independent of surgeon volume o<0.001. • Many surgeons ignore the information given by the nerve monitoring tube if they don’t like what it says. • Highest recurrent layrngeal nerve injury rates seen in surgeons performing 20-30 cases / year using nerve monitoring endotracheal tubes. • Nerve monitoring endotracheal tube use is touted as protecting both the patient from injury and the doctor from malpractice suits; it would seem that these assumptions may be incorrect. Conclusions and Take Home Messages About Nerve Monitoring Endotracheal Tubes. If you are considering thyroid or parathyroid surgery, it is very important for you to discuss the type of anesthesia that your surgeon is planning to use. You should discuss whether he/she is planning on intubating you (putting a tube down your throat and into your trachea) to put you asleep. Beyond that, you must ask if he/she is going to be using a nerve-monitoring endotracheal tube as discussed in this blog. If so, then you need to ask them tough questions, including: 1) does the tube always work? 2) does the tube ever stop working during the operation? 3) If the tube stops working, how do you know that it is a broken tube and not a broken vocal cord nerve? 4) Have you ever injured a vocal cord nerve? 5) what will you do if you injure my vocal cord nerve? 6) Do you believe that the use of the nerve monitoring tube decreases the likelihood that you will be sued for malpractice if you injure my vocal cord nerve? We see people in our office every week that have had a vocal cord injury from parathyroid surgery and these people are miserable. Almost every time it occurs in a patient who’s surgeon used a nerve monitoring endotracheal tube, and like the data above shows, that surgeon operated for hours and hours and hurt the patient. It is my strongest opinion that a nerve injury that occurs in the presence of a nerve monitoring endotracheal tube should INCREASE the likelihood of a malpractice case against the doctor if he she (as the data shows) operates more aggressively and longer. Abstract and full publication in review for publication: Journal of the American College of Surgeons, 2013. We do not intubate our parathyroid surgery patients unless they are over 300 pounds (and sometimes we don’t intubate them!). We never use nerve monitoring endotracheal tubes. The incidence of recurrent nerve in jury in our practice (4 surgeons combined) is less than 1 per 1500 cases, and none have been permanent (all lasting 3 months or less) in our last 23,000 cases. Watch us perform a full, four-gland mini-parathyroid operation (skin cut to bandaid) in less than 13 minutes.